Some other blog I was reading described the game as such: “first off, for those who are unfamiliar with the game, its literally gay.” Also this week, Final Solider and the WiiWare game, Groovin’ Blocks. School’s back in session, but it’s not the only place to get your brain buzzing. This week’s additions to the Wii™ Shop Channel include a challenging new puzzle game available via WiiWare™, plus a pair of crackling Virtual Console™ actioners to keep your imagination raging between classes. Even if your school days are behind you, this latest lineup of downloadable titles will help get you fired up for fall, fueled by the one-of-a-kind fun of Nintendo’s top-selling Wii™ system. Groovin’ Blocks (Empty Clip Studios, 1-2 players, Rated E for Everyone, 800 Wii Points): A music-based game like no other, Groovin’ Blocks adds innovative musical game play to an addictive action/puzzle game foundation. Play to the rhythm of the music to increase your score, and try to hit “Superbeats” to double your multiplier. Go for the high score in each of the 27 stages as you collect stars to unlock 15 levels of power-ups. Groovin’ Blocks features three skill levels, from the accessible Casual to the fiendish Hard mode. Play with your friends in co-op mode or against them head-to-head. Head-to-head brings it up a notch as the power-ups now become attacks on your opponent. Play head-to-head with people of all skill levels using a golf-style handicapping system. Final Solider (TurboGrafx16, 1 player, Rated E for Everyone—Mild Fantasy Violence, 700 Wii Points): A vertically scrolling shooter from the well-known Soldier series. In the 23rd century, invaders from the future suddenly attack Earth. Controlling a fighter created by the world’s scientists, you rise to meet the enemy. Collect power-up units, such as LASER, E-BEAM, FIRE and MISSILE, and then equip them in Options to launch a variety of attacks. For each of these weapons, you can freely select from three different types in SET-UP. Anticipate enemies’ strikes and deftly switch between weapons to defeat the invaders. In addition to NORMAL GAME, there are also 2 MINUTE GAME and 5 MINUTE GAME score-attack modes. The most perfect blend and balance of any game in the series, Final Soldier is a title you don’t want to miss. 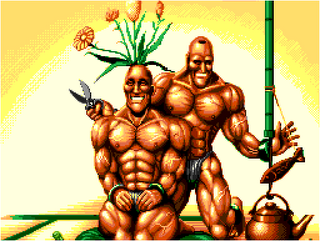 Cho Aniki (TurboGrafx16 CD-ROM, 1 player, Rated E10+ for Everyone and Older—Mild Fantasy Violence, Mild Suggestive Themes, 900 Wii Points): The odd world in this shooter made for quite the conversation piece in its day. Players control either Idaten or Benten, celestial warriors out to bring an end to the tyrannical rule of the emperor of Planet Builder, who holds muscular prowess to be the supreme virtue of the universe. Aided by able-bodied muscle-head options Adon and Samson, they must battle to defeat the emperor’s army across five stages. Use the buttons to fire away and lay into the Builder forces. Power up your character and options with protein from defeated enemies to have them “bulk up” with a yell, and take their macho battle to the next level. The list of downloadable games is updated weekly on Nintendo’s Online Press Room at press.nintendo.com.